Today's post is inspired by Tractor Supply and its PAW in-store event, which is going on NOW through September 20! PAW stands for Pet Appreciation Week and we love that Tractor Supply is dedicating this week to special in-store events that all culminate with a Main Event on September 20, featuring pet adoptions, giveaways, special deals on pet supplies and more! What's REALLY cool, is that all year round the folks at Tractor Supply are involved in the well-being of all the animals in their neighborhoods. 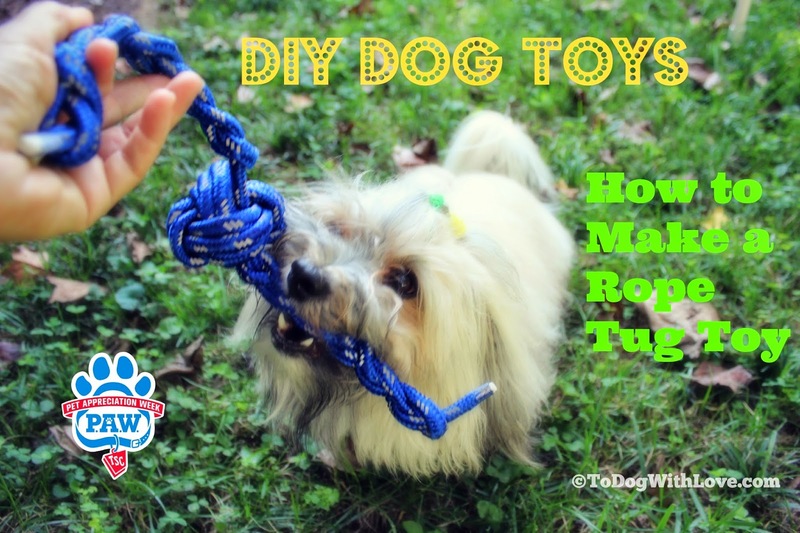 And since you can always pick up the supplies you need at a great price, we went on a hunt at Tractor Supply to find the perfect supplies for a fun and inexpensive DIY dog toy project… one that we can use at home AND that we can share with local shelter pets to help enrich their lives. 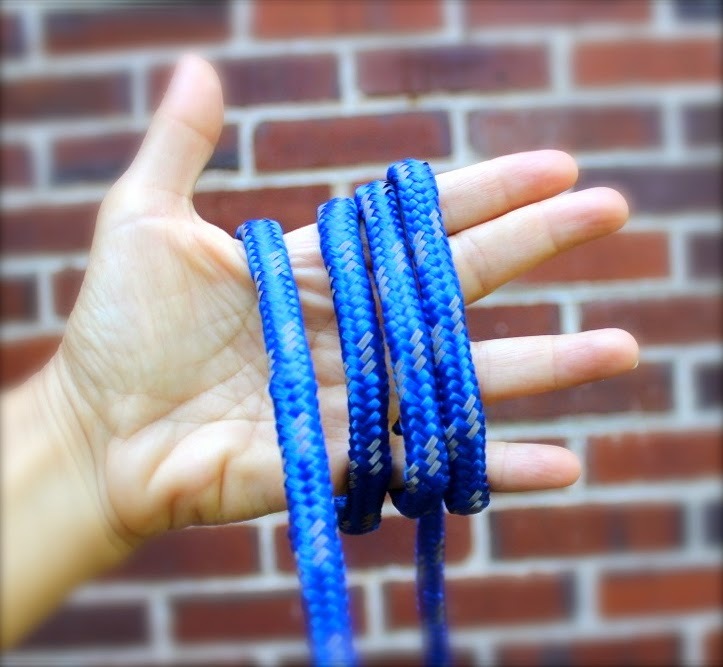 Cut your rope to a 10-foot length. 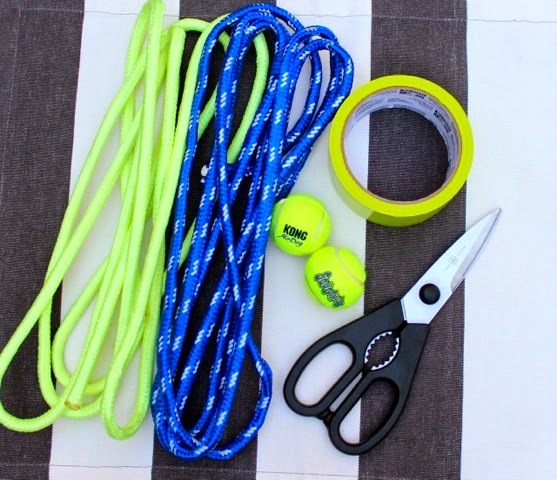 Tape the ends of the rope so that is doesn't fray while you're working with it. 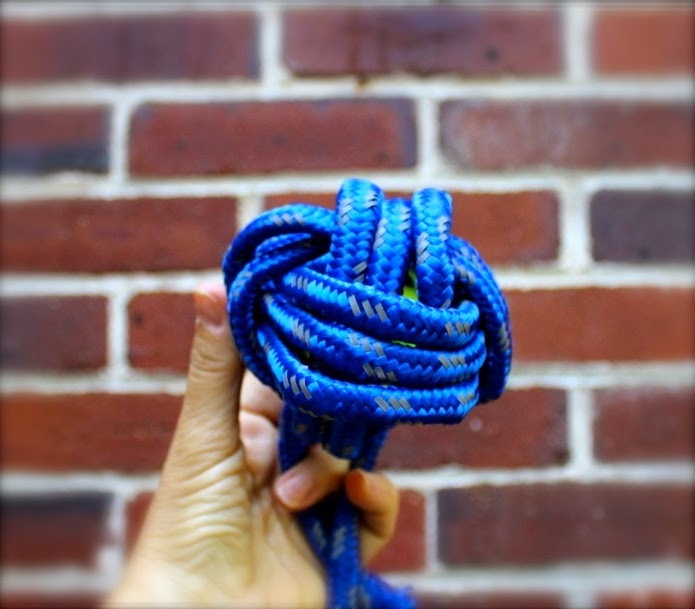 Starting in the middle of the rope, start forming a Monkey's Fist knot. This is the most difficult part of the project, but I can vouch that it's super easy to learn. I had NO previous knot-typing experience and now that I've learned how to make one, I can make this entire toy in about five minutes! Start by wrapping three turns around your fingers. Place the end through the middle, and make three more turns around the first ones. At this point, you can insert the x-small tennis ball. This will help form the knot but it's not essential. Make three more turns, passing the rope around the outside of the second set of turns and inside the first set of turns. This will help secure the knot. 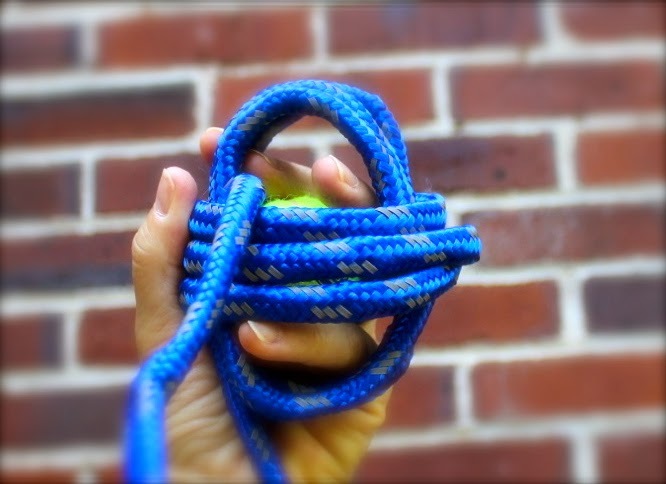 Tighten up the knot by pulling the pieces of rope taut throughout the Monkey's Fist. 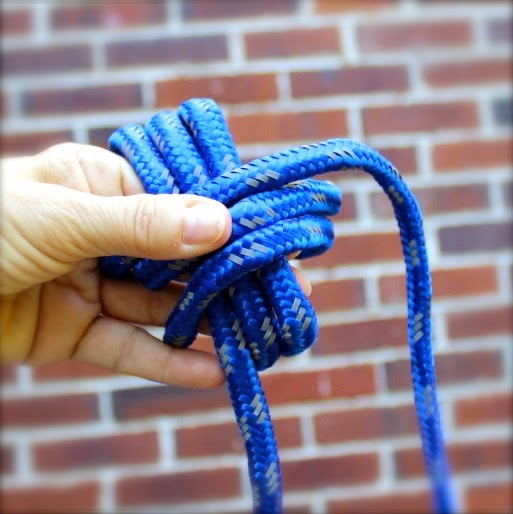 Here are a couple of links I found quite useful while learning how to tie a Monkey's Fist. 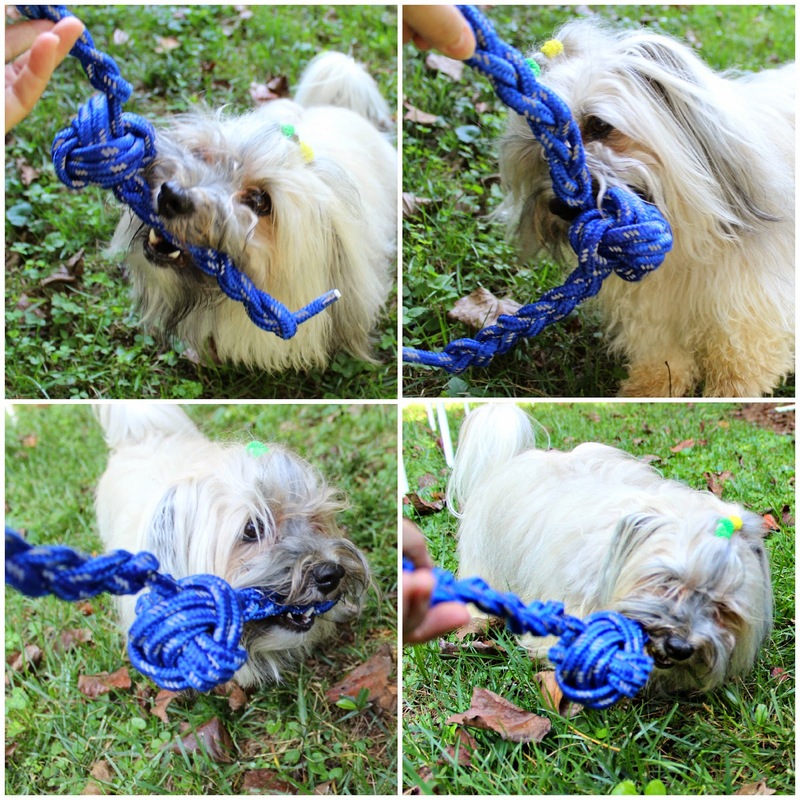 Finish the toy by braiding the ends so that both you and your pup will have something to grab onto! 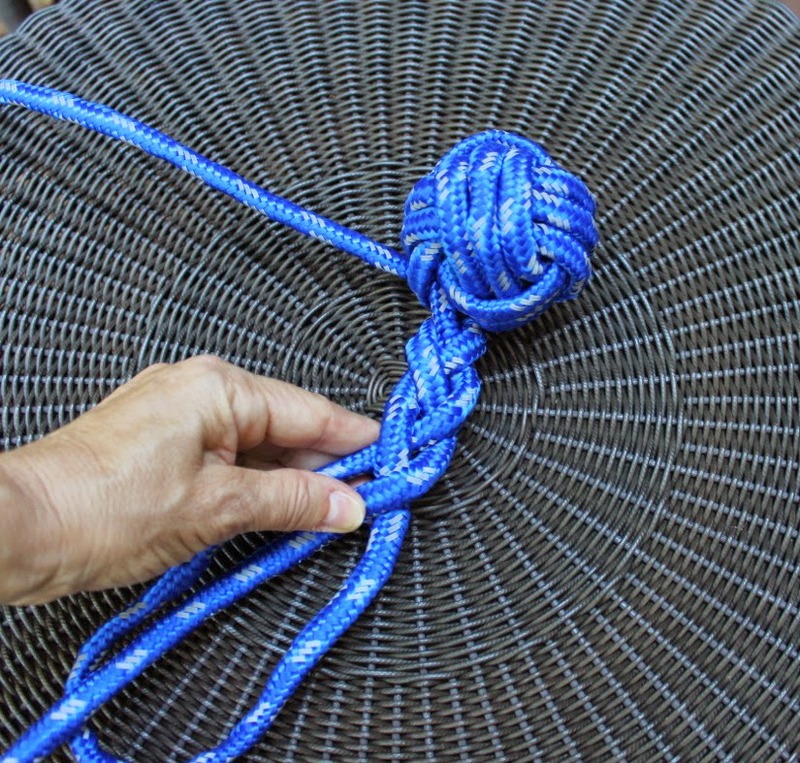 Take the extra rope on one end and loop it up so that there are three pieces to work with. 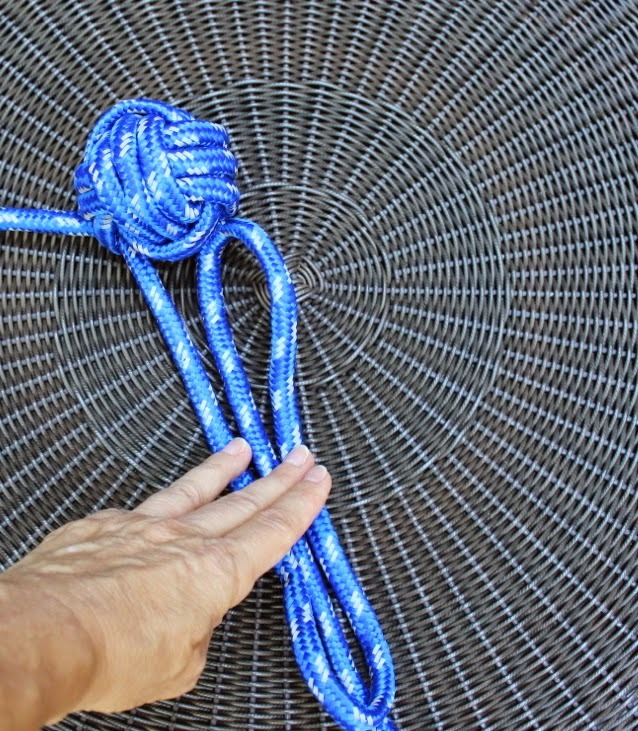 Start braiding from the top and finish it by looping the rope through the final braid. Repeat on the other end. Voila! You're done and you have a fun rope toy, perfect for doggie play time. NOTE: Play time with toys such as this rope toy should always be supervised. It's intended as an interactive toy that you can use to play WITH your dog -- whether it's your dog at home or a toy you provide for the play and enrichment of animal shelters dogs. This toy may not be suitable for dogs who like to eat rope, as ingesting rope can be harmful to your pet. Take a look at Rocco, enjoying a good game of tug with me! At Tractor Supply, it's always like a fun scavenger hunt for me, looking for the best items I can use in their bargain bins. The rope I used in this toy was a super find, so I was able to make each of these toys (without the tennis balls) for only 60 cents each! Add the tennis balls and you're still only looking at a price of about $1.90 per toy. and get a little something extra for Rocco! Rocco says he's keeping this one! In addition to the great assortment of products and great deals, I love shopping at Tractor Supply because Rocco gets to go with me, and the nice folks there give him yummy treats at the checkout counter! Don't forget to head to your local Tractor Supply this Saturday for the special PAW Main Event! Each store is hosting its own activities so you might want to check the schedule at your local store before you head out. This post is sponsored by Tractor Supply Company and the Pet Blogger Network. I am being compensated for helping spread the word about Tractor Supply Company, but To Dog With Love only shares information we feel is relevant to our readers. Tractor Supply Company is not responsible for the content of this article. What a great affordable toy! I'll have to pick up some of the supplies this week! What a great project! TSC is our absolute favorite store, and this DIY campaign has been the most fun ever! I loved you wagon too! I haven't seen anything like it! Clever mum we say. Have a tremendous Thursday. That's the sort of toy even I can make :) I think Laika would absolutely love one of those; I know what's on my shopping list now. I needed something simple, myself! 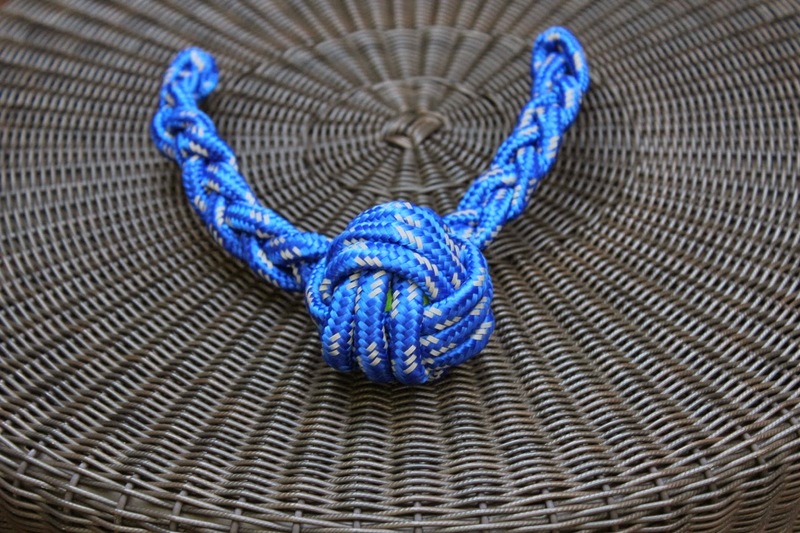 Once you start tying knots, you might get hooked! It's very therapeutic! Love the dog rope toy! Rope toys are my dogs favorite to play with. They can spend an entire day chasing, pulling and tugging on them! 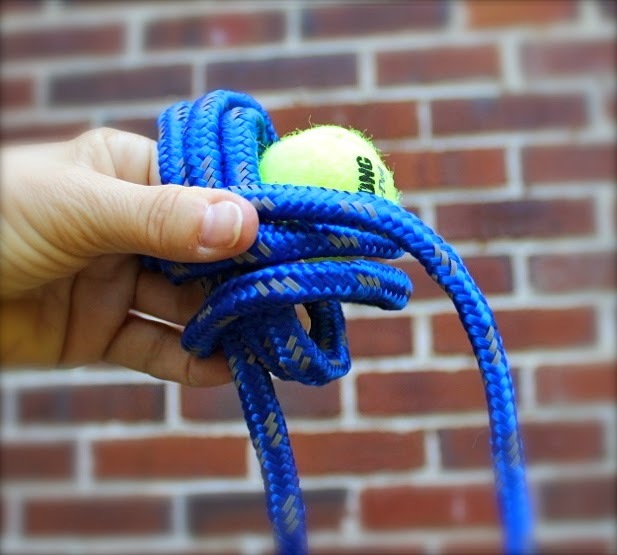 What a great diy dog toy article. I can't wait to try this! I love this idea! I am going to buy my supplies for making some on Saturday for PetSavers! ☺ Yay! Very creative! We love TSC, and have really enjoyed seeing all the different projects everyone has done. I think you definitely got the most for your money! Haha! Awesome!! Great minds think alike! Did you ever think about the outcomes of acquiring an unseemly Dogs toy? Rather than obtaining only a charming toy, there are numerous different elements that you ought to consider when making the buy. 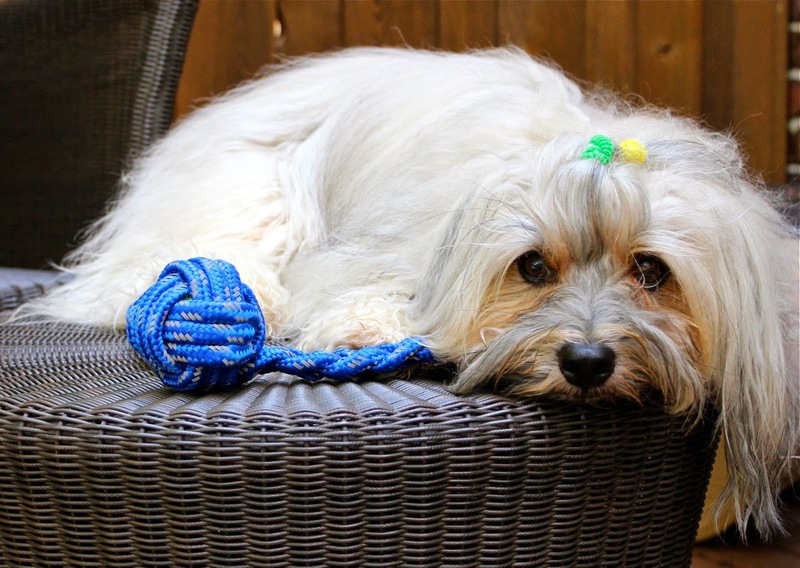 Did you ever think about the outcomes of buying an unseemly puppy toy? Rather than buying only an adorable toy, there are numerous different elements that you ought to consider when making the buy. I find a very good website for the barbecue cleaning service , You can visit this site.